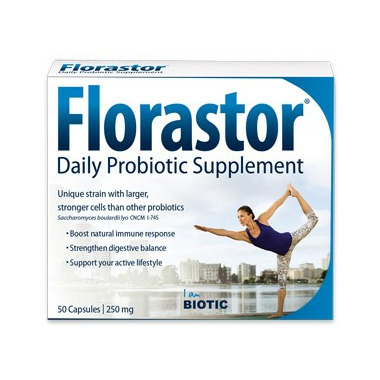 Florastor capsules help you maintain a healthy digestive balance every day. 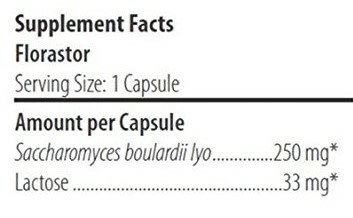 Each capsule contains 250mg of the unique probiotic strain, Saccharomyces boulardii lyo CNCM I-745. Made with natural ingredients that are vegetarian, gluten-free, and appropriate for lactose intolerance, Florastor probiotics complement your healthy and active lifestyle. Suggested Use: Take 2 capsules 1–2 times daily. Buyer Beware! Disappointed. The box says "Daily Supplement" in large print, but then the fine print is that you can only use it for one week! This is not a daily supplement, it is only to be taken if you are on antibiotics....there are other brands that you can take daily - it just can't be this one. I love the ease of use and no requirement to be refrigerated. A gastroenterologist recommended this to me and it works! These probiotics are changing my life! I was always constipated, bloated, no energy and terrible skin. I've taken these for 4 weeks now and I feel great!